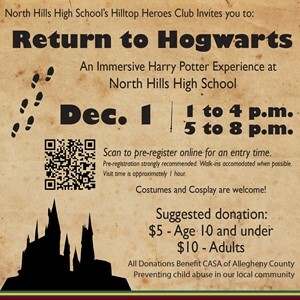 The North Hills High School Hilltop Heroes will hold “Return to Hogwarts,” an immersive Harry Potter experience, on Dec. 1 from 1 to 4 p.m. and from 5 to 8 p.m. at North Hills High School. Entry to the event is donation-based with a suggested donation of $5 for children under age 10 and $10 for adults with all proceeds benefiting CASA of Allegheny County to help prevent child abuse in our local community. Attendees should pre-register online to reserve an entry time. The expected visit time is approximately one hour. Pre-registration is strongly recommended, but walk-ins will be accommodated when possible. Costumes and cosplay are welcome during this family-friendly event! Questions? Contact North Hills High School school counselor and Hilltop Heroes sponsor Dr. David Barkovich at barkovichd@nhsd.net.